In 1961, Hannah Arendt, the German-Jewish philosopher and political theorist is asked by The New Yorker to cover the trial of Nazi Adolf Eichmann. During World War 2, Eichmann was one of the SS officers responsible for organising the mass deportation of Jews to Eastern European extermination camps. Eichmann had escaped the Nuremberg trials (1946-49) by hiding in Austria and then Argentina. He was eventually captured by the Mossad, taken back to Israel and interrogated before standing trial in Jerusalem. The concept is actually much more challenging and nuanced. Arendt’s defenders make it clear that she wasn’t minimising Eichmann’s actions or saying he was merely following orders. And this is where the film struggles with its material. In order to really understand what Arendt meant by the banality of evil, one has to read Eichmann in Jerusalem which is a lot more work than your average filmgoer (or indeed reviewer) is likely to do. Director Margarethe von Trotta and her co-writer Pam Katz do everything possible to dramatise the development of Arendt’s ideas. We are introduced to her in the context of her American life where she is a respected academic with a couple of philosophical blockbusters to her name (The Origins of Totalitarianism and The Human Condition). She is part of a group that includes the soon-to-be-author Mary McCarthy (McTeer). She is an important member of an elite intellectual circle. Her present is contrasted with flashbacks to her life as a young student, when she had a relationship with her teacher Martin Heidegger. Her connection with the famous philosopher angered her Jewish friends because of his affiliation with the Nazis. It is clear that some considered Arendt a troublemaker and self-hating Jew well before the 1960s. These charges and more were levelled against her after the publication of Eichmann in Jerusalem. There were many who specifically read her work as blaming Jewish authorities of being complicit in the Holocaust. This argument has simmered for fifty years. The rigorousness of Arendt’s scholarship has been much challenged and defended. Von Trotta’s movie is undoubtedly pro-Arendt however we are allowed to see an intractable side to the philosopher. She will not relent on an idea simply because others don’t like it. She is more than prepared to lose friends in order to get at the truth as she sees it. 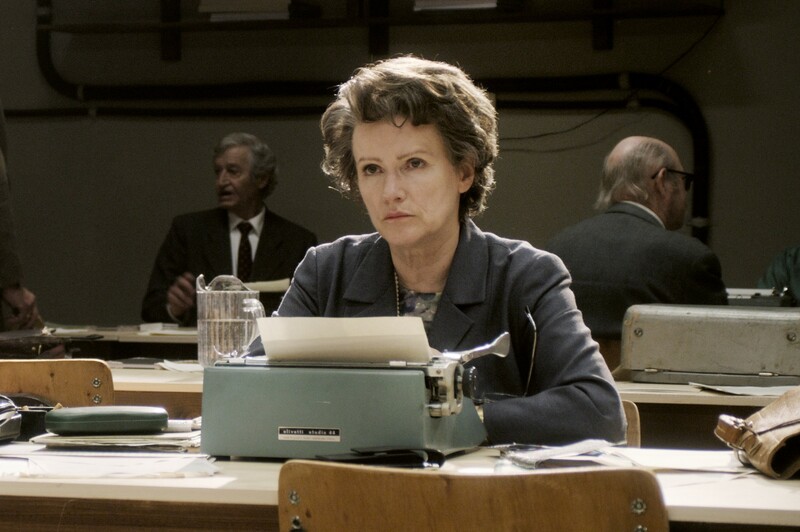 Hannah Arendt is a well made movie that convincingly sets up the early 1960s. When Arendt is in Jerusalem we are given a fascinating insight into Eichmann through Von Trotta’s choice to portray him with the actual trial film. We are given the opportunity to see some of what the world saw of the man in the glass booth. Being a biopic there is a certain episodic quality about the story telling. Many of the figures in Arendt’s life are wheeled on quickly and disappear just as quickly. Barbara Sukowa is excellent in the lead role. She gives Arendt a roundedness and depth, which is much needed. The script is filled with scenes where ideas are discussed by its intellectual characters. As absolutely necessary as this is, an audience has to pay attention in order to not get lost. HANNAH ARENDT is an accomplished and thoughtful work about big ideas. Perhaps the best service this film performs is as a preview of Arendt’s writings. After seeing this film and doing the review I realise that a CliffsNotes version of her work is not sufficient to understand the idea of the banality of evil.